Toyota Motor Corporation and Toyota Central R&D Labs have released Version 6 of the Total Human Model for Safety (THUMS*), its virtual crash dummy software. Researched and developed for over 20 years by the two companies, THUMS simulates detailed computer analysis of human body injuries caused by vehicle collisions. 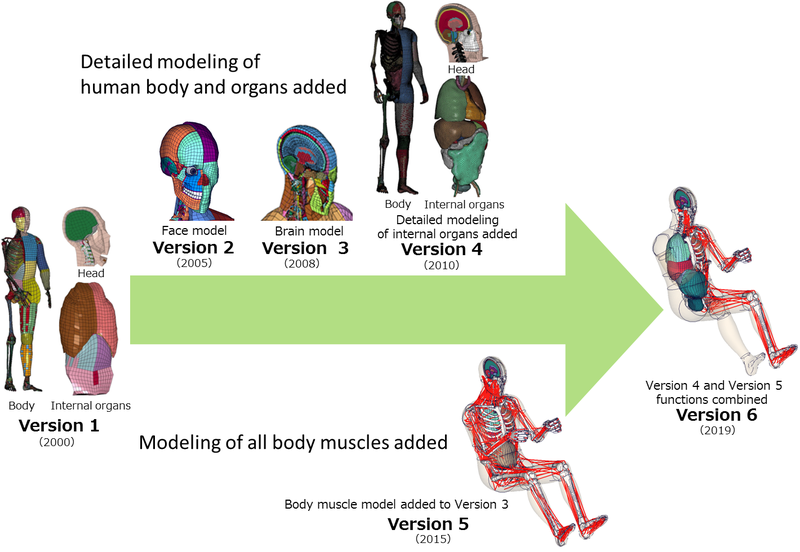 The partners say the new software features internal organ modelling and a new muscle model that simulates a variety of occupant postures, including braced and relaxed, permitting a more detailed analysis by anticipating various occupant postures as the widespread deployment of automated vehicles continues to advance. Interested company can purchase THUMS through the JSOL Corporation (Tokyo) and ESI Group (Tokyo). The carmaker says, the software has been used in vehicle safety technology research by Toyota as well as automobile manufacturers, parts manufacturers, universities, research institutions in Japan and overseas. The previous version of THUMS (Version 5) simulates changes in occupant posture by considering occupants’ pre-collision muscular states, while THUMS Version 4 accurately analyses injuries sustained to bones and internal organs at the point of collision. Previously, injury researchers aiming to both simulate pre-collision changes in occupant posture and to analyse occupant injuries sustained at the point of collision were required to combine Versions 4 and 5 of the software. The newly developed THUMS Version 6 allows researchers to study the changes in pre-collision occupant posture and injuries sustained at the point of collision with a high degree of accuracy and, since there is no longer any need to switch between different THUMS versions, it will also contribute to improved work efficiency. As preventive safety equipment becomes more widespread in tandem with the deployment of automated driving technologies, occupants are anticipated to assume a wider variety of postures at the point of collision than previously; in particular, driving support functions may result in drivers assuming a more relaxed posture. Toyota expects that THUMS Version 6 will be used in the development of safety technologies that help protect occupants in a variety of different conditions. Toyota Motors says that in addition to developing preventive safety and automated driving technologies, it intends to research and develop technologies that help protect occupants in the event of a collision by utilising THUMS, and provide safety and security to its customers under a diverse range of conditions.